May 5, 2009 | The famous charging bull. Figured it was worth a visit since we were in the area. There were a bunch of tourists taking pictures so we had to wait a bit to get a clear shot! 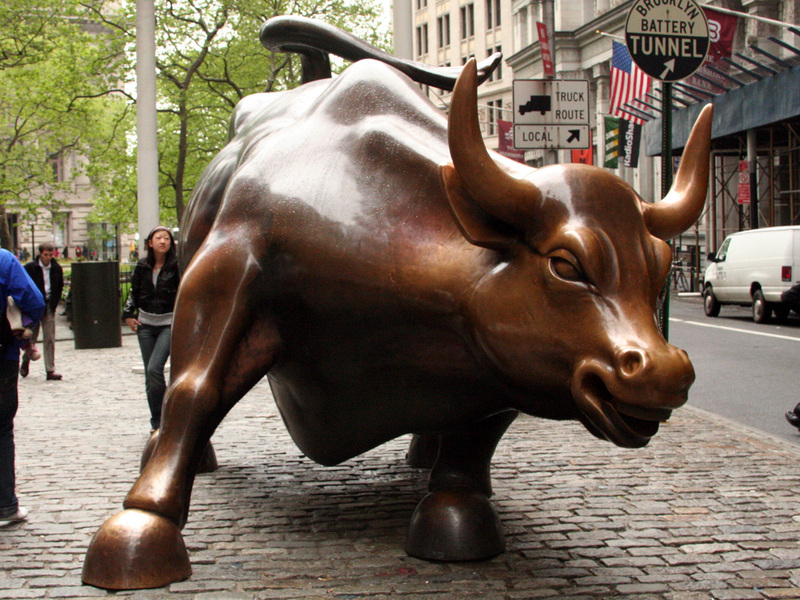 The bull is a “symbol of aggressive financial optimism and prosperity” (Wikipedia). This one was created by Arturo di Modica in 1989 following the 1987 stock market crash and given as a gift to the city. People say you’re supposed to rub it’s horns, nose, and testicles for good luck! I didn’t but maybe I should have? May 4, 2009 | More food! I really wanted to refrain from posting too many pictures of food here since I have a blog dedicated to food (check it out here! ), but there are some that I just couldn’t resist! 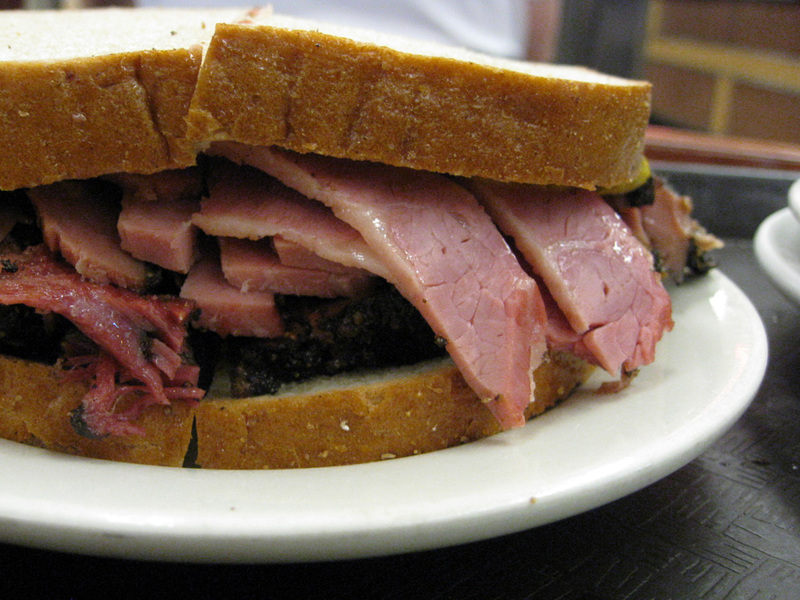 Katz’s Deli is a MUST try! I finally tried the famous pastrami and rye! I was somewhat skeptical at first. It looks very plain and it isn’t cheap for a sandwich. But once I took a bite into it, I finally understood what all the craze was about! The meat was extremely tender! Katz’s Deli has an interesting system. Walk in, every person gets a ticket. When you order, you hand the guy your ticket and he adds your order onto the ticket. Then, when you leave, you present your ticket (everyone has to present it whether they used it or not), and the person adds up your order. If you lose your ticket, it’s $50! We had a scare where we thought we had lost one of our tickets, but luckily, it had just fallen under the table. Whew! May 4, 2009 | Ah, the day of eating! Seriously, Monica and I ate ALL day. While it was not the first place we visited, Russ & Daughters was definitely one of the favorites! The bagel was dense, the cream cheese was fresh, the sesame added the right amount of texture, and the smoked salmon was just perfect. 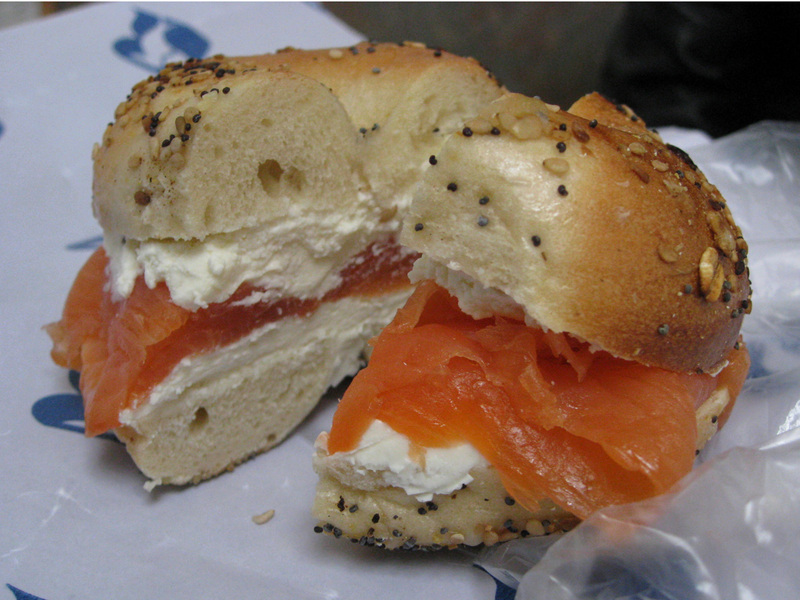 Monica and I shared a mini Classic (bagel, cream cheese, Norweigan smoked salmon) and we just could NOT get enough of it. OMG. It was extremely satisfying. This isn’t really a sit-down type of place, so we walked over to a nearby market where we could sit and eat. I seirously considering ordering some of their stuff from their webpage until I realized the shipping would be roughly $50! If you’re ever in New York City, TRY IT!! 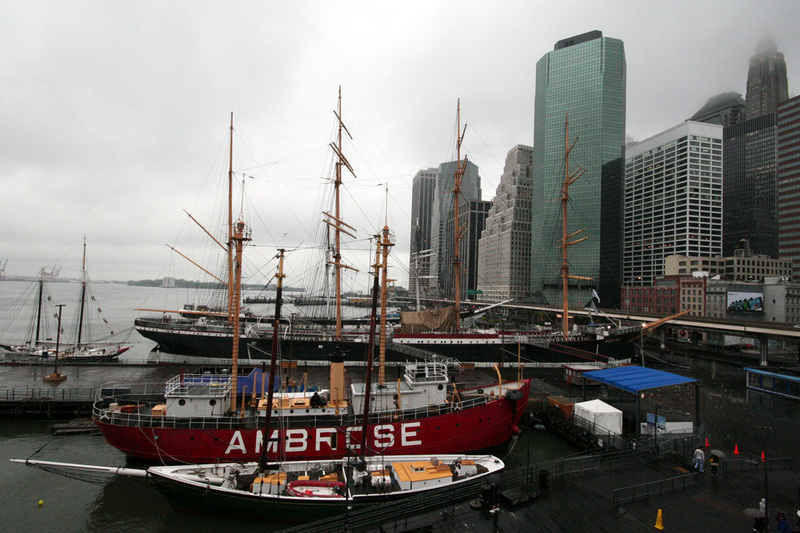 May 3, 2009 | Although I went to the pier with the intentions of getting a good shot of the Brooklyn Bridge, I decided the angle wasn’t the best and took a few pictures of the view on the other side. Anyhow, this place is somewhat nostalgic for me. This place will always remind me of my friend Patty who passed away a couple of years ago in a car accident. The last time I was here was Spring Break of 2003 and Patty was showing Elaine (another friend from school) and I around the city. We didn’t even do much here, but I did take a picture of her standing in front of the pier, and it’s one of the images of her that I remember the most. Patty, may you rest in peace. 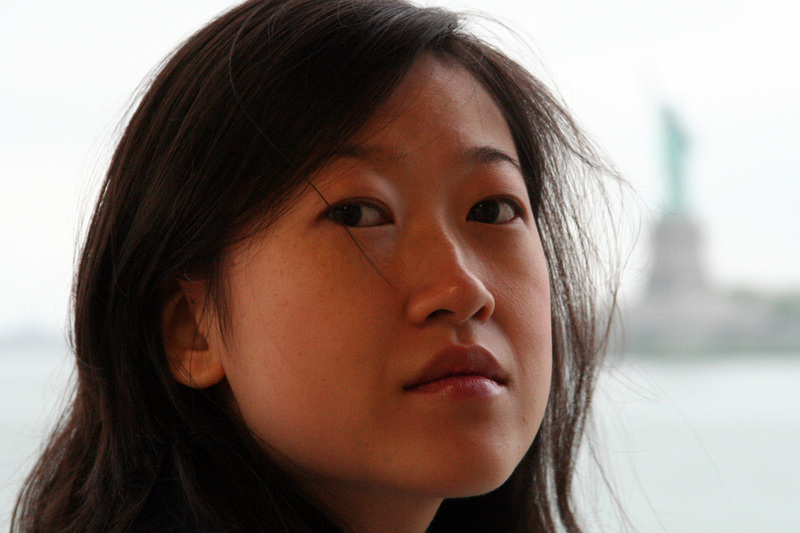 May 3, 2009 | The rain didn’t stop us from standing outside on the Staten Island Ferry. I’ve already been up the Statue of Liberty before, and decided for time/money purposes, this time I would just take the free ferry and view the statue from afar. Yep, it’s Monica, my model for the trip, haha. Jen doesn’t look being in my pictures so, it’ll just be Monica. Anyway, see the statue blurred in the background? With the rain, it was hard to get a super clear shot anyway. I love boats so I enjoyed taking the ferry ride. They have viewing decks in the front and back of the ferry, but it’s extremely windy in the front. The ferry is mostly used by commuters so we weren’t crowded by tourists. I would recommend taking the Staten Island Ferry instead of actually visiting the Statue of Liberty for someone who might have time or money constraints! 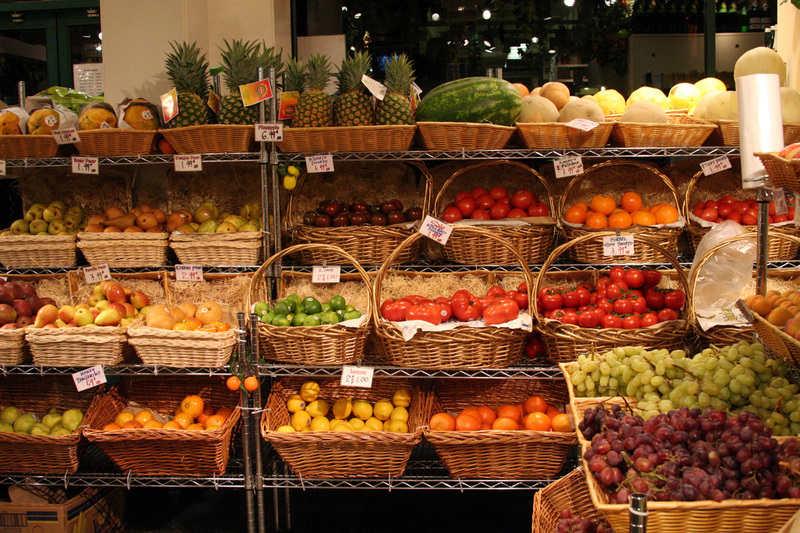 May 2, 2009 | Before we returned to my sister’s apartment to retire for the night, we stopped by her local grocery store. I can’t figure out the name, but it’s near 14th and 1st Ave…I think, haha. The place wasn’t very big– nowhere close to the size of the grocery stores I frequent in Houston– but there were a ton of groceries packed into the small space! The fruit was displayed in such a cute way, I ducked out of sight from other people and took a shot! Haha, I felt a little silly taking a picture in the grocery store. I’m glad the check-out girls didn’t see me because right after this shot, my sister introduced me to them! I always thought it’d be a huge hassle having to walk to the grocery store, but I suppose if it’s close by, and you walk by it anyway, it’s fairly covenient, and there’s definitely advantages to planning meals for a day or two at a time! 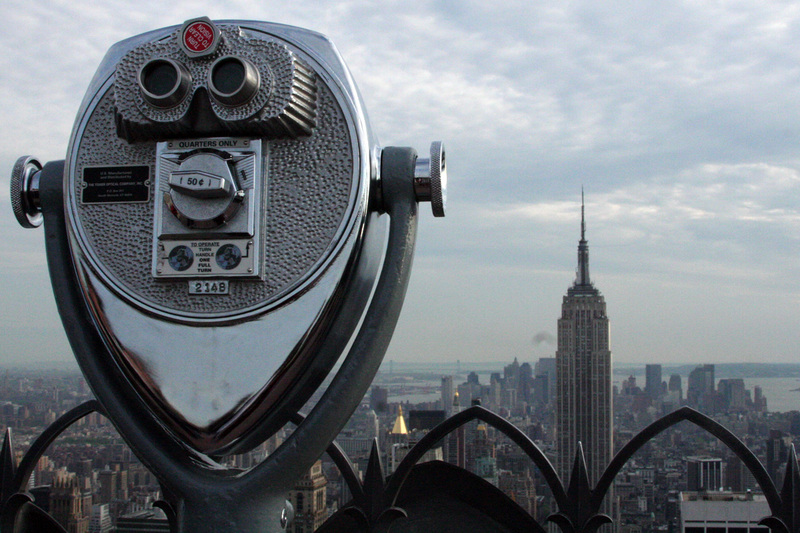 May 2, 2009 | I learned of Top of the Rock at the end of my last visit and vowed to visit the next time I had the opportunity to do so. As usual, my sister refused to go up and opted to check out J. Crew. (Jen finds going up a building/structure and back down completely pointless!) Luckily, Monica came along, as she was leaving the city in a month or so and wanted to see some of the sites before she left. It was here that I saw a sign of Swine Flu scare in person! To no surprise, it was a couple of Japanese tourists who were wearing mouth guards, haha. Anyhow, once we were on top, there was an awesome view of the city! Apparently the famous photograph that decorates the walls of many poor college students, Men on Beam, was taken during the construction of the GE Building– anyone watch 30 Rock?? Tina Fey is awesome!